"We carefully add more parameters, which we counterbalance by adding a 'Sobolev norm' on the objective function we use to optimize the inverse operator," Rajagopal said. 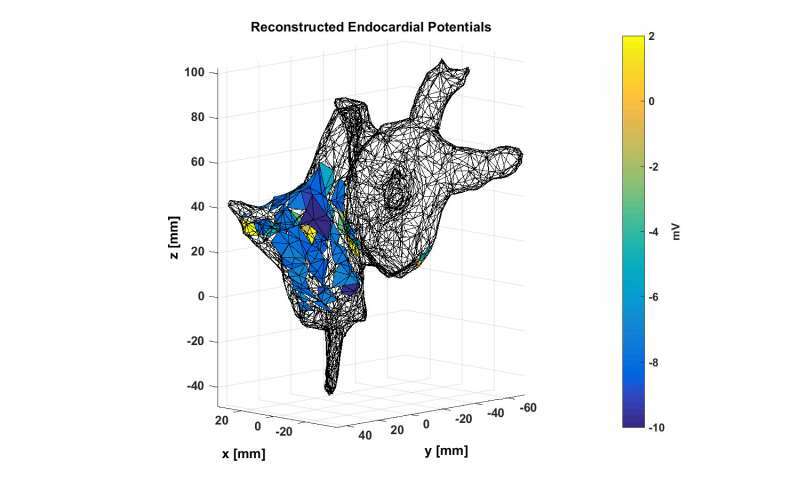 "The newly added parameters allow presumed models of body tissue to be optimized by real data to provide more accurate reconstructions of endocardial potentials." This allows them to learn a model for predicting cardiac potentials from electrocardiograms that's "realistic, accurate, and amenable to general purpose use as a new cardiac imaging tool," said Rajagopal. The group's work is significant because it suggests that much higher resolution reconstruction is possible if nonlinear reconstruction algorithms are used, compared with what is theoretically known using linear methods and partial data, Rajagopal said. "We were surprised that we didn't need to explode the number of parameters allowed in the reconstruction. By adding just a few extra parameters—while still respecting the structure of the original reconstruction algorithm—we found that high-accuracy reconstruction is possible." There are myriad applications for the group's method. "Imagine a world where instead of a doctor listening to your heart through a stethoscope they can see a live video of your heart beating via ultrasound with corresponding electrical measurements of the local potentials on or around the cardiac tissue," said Rajagopal. "The goal is for doctors to be able to treat patients with cardiac issues without needing to use invasive surgeries just to determine the cause." In some cases of atrial fibrillation, for instance, doctors might be able to localize the source and determine whether surgery is recommended for the patient. "A lot of work remains to be done before we can make this a reality," he said. "But our work is a good step in that direction, since it shows that the resolution of the noninvasive reconstruction can be sufficiently high to aid in diagnosis and prognosis of such cardiac disorders."